All the islands of Hawaii have something special to offer. Maui has the Road to Hanna. Oahu has Pearl Harbor and the famed Waikiki Beach. Kauai is a rustic paradise for needed time alone. The Big Island of course has the active Kilauea volcano but it also has something truly special for the tea lover. Did you know that the Big Island hosts a number of tea estates? If you’re a tea lover you need to plan your next vacation to include a Hawaiian tea tour. Why is Hawaii so perfect for growing tea? Tea loves a few things that the Big Island has to offer. According to research from the University of Hawaii, there are some unique characteristics of the island’s environment that allow tea to thrive there. The plants love the slightly acidic soil with good drainage, elevations above 1500 ft. and fog in the morning and late afternoon. 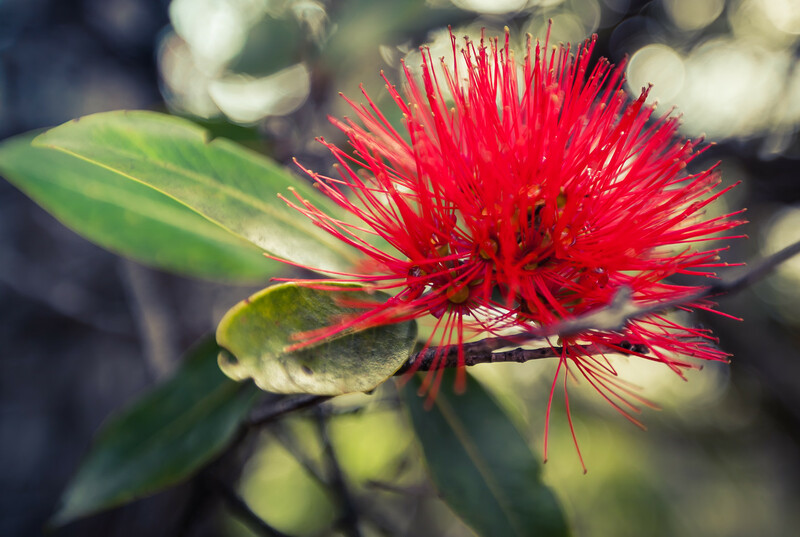 Thanks to its volcanic origins and activity, the Big Island offers all of these. For your next vacation, take a tea tour in paradise. While there is more than one option for a Hawaiian tea tour, I only had time for one visit to a tea plantation on the Big Island on my recent vacation. After spending a morning with Eliah at Big Island Tea, I feel like I absolutely made the best choice for my tea tour experience. Big Island Tea, established in 2001, is one of Hawaii’s pioneer tea gardens. Found at ~ 3000’ on the NE slope of Mauna Loa volcano on a 400-year-old ash deposit, the environment is ideal for growing a premium tea. We produce ultra-premium single-batch whole leaf green and black tea. If you’re expecting a tea estate like one in China or India, you will be in for surprise. Their mission to reclaim cleared land and return it to a more native landscape means a menagerie of plants. The tea is grown “wild style” with bushes interspersed with banana trees, Lehua blossoms and Ti plants. Why not put the tea plants in pretty rows? Because Eliah believes in listening to the land. She says she isn’t a tea expert but a simple farmer, experimenting to find the best way to grow her tea and care for the land. If a plant isn’t flourishing in one spot she will simply dig it up and put it somewhere new. The banana leaves make great compost, placed directly at the base of the plant along with egg shells or coffee grounds from the house. If something isn’t workout she tries something else. There is no manual for her work; passion and serendipity lead the way. The result is a beautifully complex tea with a depth of flavor deeper than your usual English Breakfast. This Hawaiian tea tour was more like a wine tasting than your typical tea tasting. After walking the farm, we sat with Eliah for just over an hour tasting both the green and black varieties of teas grown on the farm. Both were delightful, but the one that really grabbed my attention was the `A`a Black Tea. With a small plate of short bread to help “cleanse the palate”, Brian and I were treated to a sample of Killinoe Green tea and two batches of `A`a Black Tea. One of the black teas was a batch so fresh that Eliah had yet to taste herself. This is a perfect example of the love and fearlessness that goes into her tea production style. She knows she grows a superior product, lovingly hand processing each batch. She had no qualms about sharing an untested product with a kindred tea spirit. Grown from seeds, Big Island Tea has layers of flavors from the soil and water that nourishes the plants. The `A`a Black Tea reminded me of Keemun yet the seeds are of Indian origin. The first steep of both batches produced subtle citrus notes on the back of my tongue. Steeped for longer, I believe 5 minutes, the tea did not become bitter but the flavors evolved. The amber color deepened and the tea flavor became infused with rose notes. Not to be ignored, the green tea was light and grassy. Again, more like a Chinese green than something grown in India. The tea tasting was made even more delightful by Eliah’s stories and knowledge, which she doesn’t give herself enough credit for. Brian and I each received a sample of `A`a Black Tea as part of the tour and tasting. I also couldn’t resist the flavor and purchased some to bring home. The samples are of a different batch than what I purchased, making each one an opportunity for a new tea drinking experience. Would you like to experience Big Island Tea too? Of course, I encourage travel often! If you are a tea lover planning your next getaway, do something different and go to the Big Island. Eliah and her husband Cam are building a guest house on the property which should be available to book by April 2018. Or you can stay in nearby Volcano Village or Hilo (although this is the rainy side of the island) and book your own tea tour or workshop to learn how to process green tea. Not only can you visit Eliah, there is also Omomea Tea Company on the northeast side of the island. While we did not have time to take a tour there Eliah spoke very highly of the team and their product. If you would like to do a wine AND tea tour you could also check out Volcano Winery. For safety, just make sure to do that tasting after your morning of hiking in Volcano National Park. Not traveling to Hawaii anytime soon? If you want a very special tea to host your own tasting party you can order direct from Eliah. Just visit the contact page for Big Island Tea and email her directly. For more pictures of our Hawaiian tea tour be sure to check out my Instagram feed!